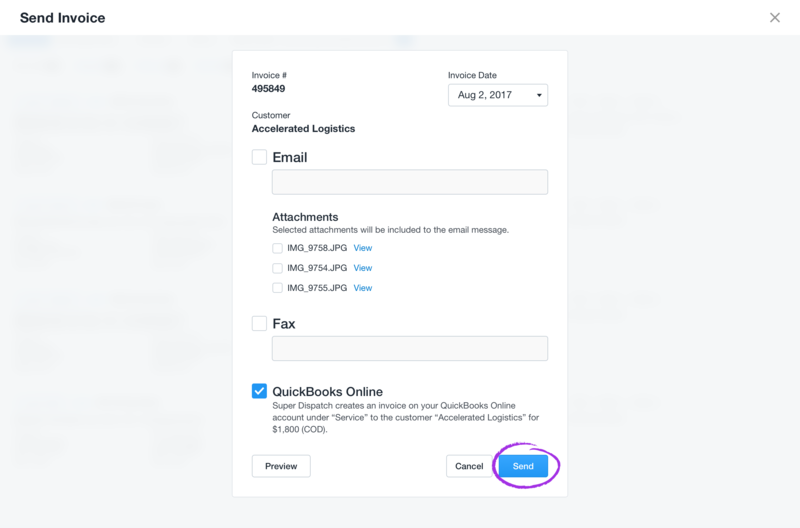 Once you have QuickBooks Online integrated with your Super Dispatch dashboard, then you can start sending your Invoices directly to your QuickBooks account with a click of a button! This will ensure that your Accounting records are up to date. If you do not have your QuickBooks Online integrated yet, PLEASE CLICK HERE TO READ the instruction on Integration QuickBooks Online with Super Dispatch dashboard. 1. Login to your Super Dispatch Dashboard. 2. Find the Order containing the Invoice you wish to send to QuickBooks. 3. Click on the "Options" button next to the Order, then select "Send Invoice". 4. Please check the QuickBooks Online check icon. 5. Please click on the Send button. 6. You have successfully sent your invoice to QuickBooks Online. If you wish to send an invoice to Email or/and Fax or/and QuickBooks Online, please select the appropriate box to send your invoice. You can select all options.